Looking for some cool treats for celebration ? This colorful DIY Plastic Champagne Cupcake Stand idea is just what you need ! They are really simple to make too! 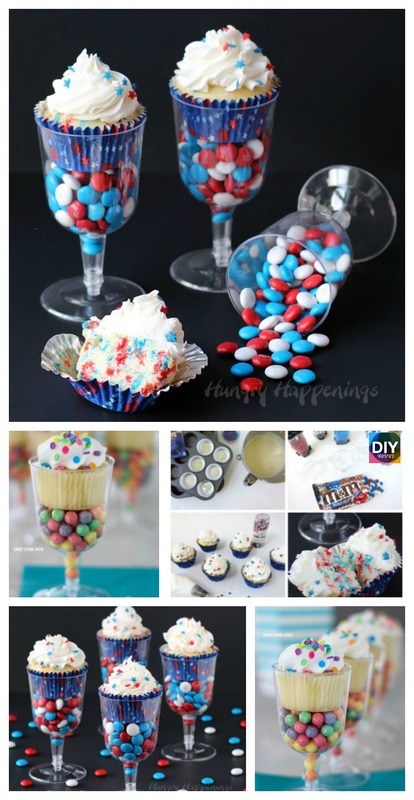 Here is the basic instructions : First, you need to obtain some cupcakes, and then pour some colored candies into a wine holder. Lastly, put the cupcake on top and it is done! Simple, right? There are also some links below that can help you further. You can decorate the cupcakes however you want, and for special occasions too! The red, white, and blue can be used for Independence Day, Memorial Day, Veteran’s Day, and many more… Enjoy ! You might also like: ballerina-dress-cupcakes .